Is this really 12-bit video ? 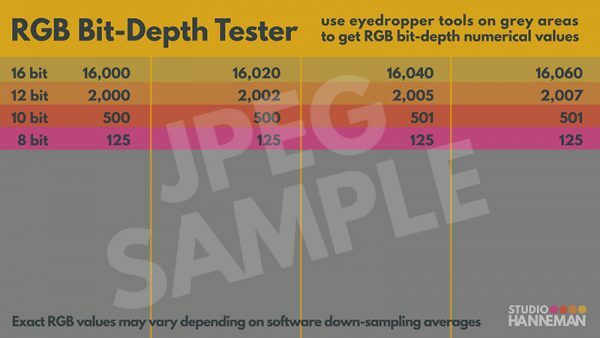 How can you tell if you’re really producing 12-bit video? Aside from a handful of DCI projectors, few displays can actually render in 12-bit color. Even if you found a proper 12-bit display, it would be challenging to visually tell the difference between 10 and 12 bit video. With the introduction DNXHR 444 and the development on new mastering workflows, I wanted to analyse the video content of my files to ensure I was not losing video information in my pipeline. Also, since DNXHR is still a new codec, not all software has been updated to read the bit-rate metadata correctly. This can lead to confusion, not knowing what you’re actually working with. 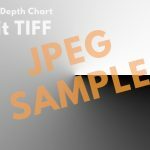 Import the TIFF in your video software, export your codec and then get the numerical RGB values for all 4 sections of the chart. – In Resolve. you can use “Show RGB Picker Values”, but the values are limited to 8-bit or 10-bit. The chart consists of 4 very similar grey values that are numerically different when processed at 12-bit or 16-bit, but get compressed when processed at 10-bit and 8-bit. Additionally, you can check for gamma shifts by comparing processed RGB numerical values to the RGB values of the original TIFF file. Studio Hanneman specializes in film finishing and color grading. Over the years, I’ve developed tools that helps me in my work. I would like to share some of these tools with you! A basic circular Black to White gradient chart – useful for visually analysing 8-bit vs 10-bit video.